Stay at the heart of the rafting action in Rishikesh on Neelkanth road! Your campsite is set on the banks of the Heul River with scenic views of green hills all around. You'll enjoy the fresh air and chilly evening here, but the highlight of this trip is your rafting session on day 2. You’ll find yourself battling exciting rapids for 16 kms over two hours, paddling from Shivpuri to Laxmanjhula. In the calmer stretches, you can also try cliff jumping and body surfing. 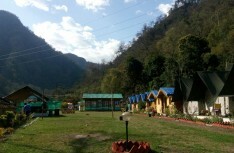 This forest campsite lies on the banks of the Heul River on Neelkanth road in Rishikesh. The Heul River is a tributary of the Ganga River and runs parallel to the Neelkanth road, which is dotted with several campsites. You'll be surrounded by lush greenery all around, and can enjoy outdoor games like cricket and volleyball, or you can take a short hike to a cascading waterfall. You’ll eat delicious buffet meals at the campsite and in the evening, there is also a delightful bonfire and snacks to look forward to. 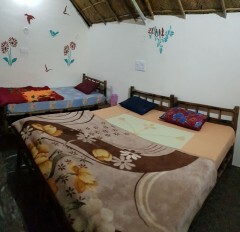 At night you’ll retire to comfortable cottages with an attached bathroom and bed, clean bedsheets, comfortable mattresses, soft pillows, air cooler and warm blankets. • Book a thrilling rafting adventure on the Ganges. • Try cliff jumping and body surfing in the calmer stretches of the river. • Enjoy snacks around a delightful bonfire. • Take in the scenic beauty that surrounds you. • Dip your feet in the cool waters of the Heul River. • Indulge in outdoor activities like cricket, volleyball and badminton. Please carry your own soft drinks, hard drinks for personal consumption on this Rishikesh rafting trip. Once booked, the trip cost is non-refundable. If cancellation is made 15 days or more before the departure date of the Rishikesh rafting trip, you can reschedule the trip within 3 months, depending on availability. If cancellation is made between 0-14 days: No refund. 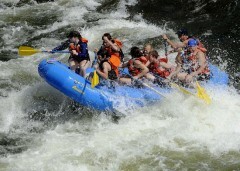 Rafting in Rishikesh is arranged considering normal weather. In case of cancellation due to reasons beyond control such as natural calamities, riots, political uncertainty, public transport failure etc, refund shall be payable with respect to the given cancellation policy. Participants are responsible for their own belongings and the campsite will not be held responsible for any loss or damage. There is no charge for children below 6 years. Children between 6-12 years of age will be charged INR 1200 for meals and accommodation, but will not be able to go rafting. Children above the age of 12 years will be charged the same as adults. You can check in by noon, and will be served a non-alcoholic welcome drink before you settle into tents. 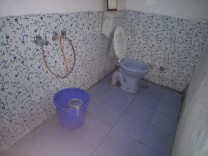 You’ll eat a delicious buffet lunch and then can can play cricket or volleyball on the spacious lawn, or take a short trek to a nearby waterfall. You can also take a dip in the cool river and return to the campsite by evening where a crackling bonfire and delicious dinner awaits you. Retire to comfortable cottages for the night as the soothing sounds of the forest lull you to sleep. Overnight stay in cottages. Wake up by 06:00 hrs and after a hearty breakfast, you'll check out from the campsite. You'll have to report at the operator's site office in Laxmanjhula and you can offload your luggage here. You'll then proceed to Shivpuri which is the start point of your 16 kms rafting session. You'll be facing some thrilling rapids on the Ganga and you can also try your hand at cliff jumping and body surfing in the calmer stretches. Your rafting trip concludes at Laxmanjhula and your trip ends here. Wake up early and enjoy hot tea and a breakfast of bread, butter, jam, aloo puri/chole bhature/paranthas, boiled eggs/omelette/egg burji. After that, you'll check out and be driven to Shivpuri, the rafting start point. Your rafting sessions ends near Laxmanjhula and your trip ends here. You can get to Rishikesh by air (Jolly Grant Airport in Dehradun, 50 kms away) or by road from Delhi and Chandigarh. Take local transport to your campsite on Neelkanth road.